Patrick Hanna was born on the 24th June 1819 in Kilmegan townland, near Castlewellan, County Down, in the north of Ireland, the fifth son of Patrick Hanna, a well-to-do farmer. A devout Roman Catholic, but staunch British Empire Loyalist, his relatives include several bishops and an Archbishop, Edward Hanna of California. 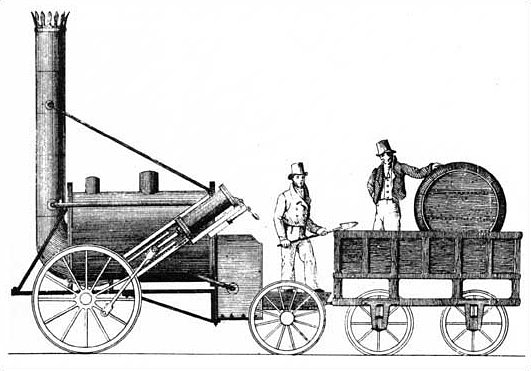 He was educated at local schools before being apprenticed at age 16 with the famous railway engineer, George Stephenson, in Newcastle on Tyne from 1835 – 1838 and then as a shipbuilder (from 1838) with various firms building steamships in England and Scotland. A Street is named after him in modern day south Melbourne. Patrick evidently developed into a very competent engineer, choosing on a chance decision to follow an opportunity in the far flung colony of the State of Victoria, Australia, on the ship Abdallah from Glasgow on the 4th April 1853 with his nephew, John Hanna. His total cost of passage was 75 pounds and his wife, Sarah Hamilton, waited a year later to join him in Australia. When she arrived in Australia on the Cairngorm in 1854 she was aged 23. In 1886 Patrick described his wife as the only surviving daughter of John Hamilton, merchant, Liverpool. On her death certificate her birth place is given as Liverpool and her father’s occupation as ‘Sea Captain’. Her mother was Sarah Donnelly. She and Patrick married in Glasgow in January 1848. Their only son was named Patrick Hamilton Hanna, who predeceased him, and six daughters. She died in 1902 aged 73. He put his knowledge of steam powered ships to good use by immediately establishing the first steam-powered City ferry across the Yarra River in Melbourne and he held the ferry licence until 1884. He also built a bridge at Seymour over the river in 1862. An enterprising and opportunistic Victorian business man, who seemed symbolic of the optimism evident in post-gold rush Melbourne, he became a landowner in various districts of the emerging city, being one of the earliest residents of Emerald Hill. His land there and the lease of the toll gates he subsequently obtained on the Sandridge, and later, Sydney roads (1859-60) laid the foundation for his later wealth. This, and a multitude of other mercantile investments, enabled Patrick Hanna to purchase LaTrobe House in William Street in 1863, and also to meet the property qualification to stand for the Legislative Council where he worked for various electorates from the local to state legislature from 1864 – 1888. In 1864 he entered Victorian Parliamentary life (1) when he stood for the Eastern province but was defeated by one vote. 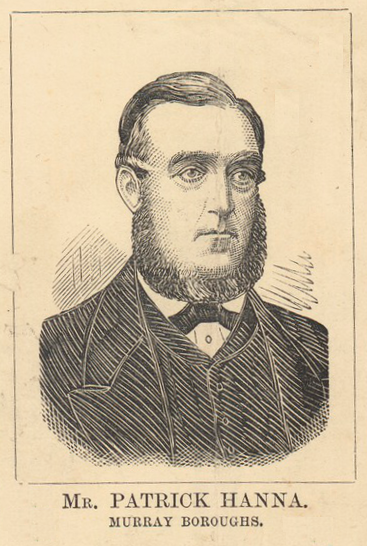 However, in 1866 he was eventually elected to the Assembly for the Murray Boroughs and held the seat until 1877 when there was a boundary change. He stood and lost another seat before re-entering parliament under a new constitution in 1882 which he held until ill-health before his death. In 1880 he was the MP who supervised the Melbourne International Exhibition. He died on 12th September 1890 (2) at his house on 277 William Street, West Melbourne, a year after the death of his only son, and is buried in Melbourne Cemetery Roman Catholic section E.